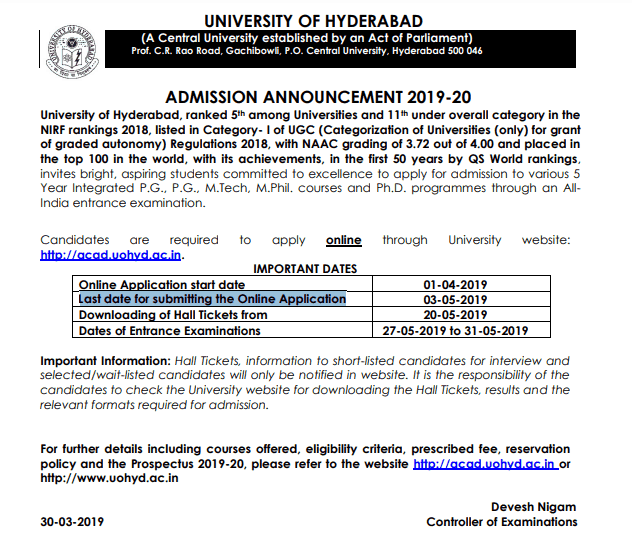 Hyderabad University Admission 2019-20 registration has been started from 1st April 2019. Last date for submitting the Online Application form is 3rd May 2019. All candidates who are interested in taking admission in University of Hyderabad. Here in this article, we have provided all information related to Hyderabad University Admission 2019-20. Read the complete article to know more about UOHYD admission 2019-20. The Hyderabad University was founded in the year 1974 and the first Vice-Chancellor was Prof. Gurbaksh Singh. The university is also known as the Hyderabad Central University. It is situated near the Gachibowli which the central IT Hub of Hyderabad and the place is rich with Biodiversity which has every aspect of nature in it. Latest Update 3/04/2019: Hyderabad University Admission Registration has been started from 1st April 2019. Interested candidates can fill the registration form by using below link. The University of Hyderabad is one of the top-ranked institutions all across India for higher education. There are numerous postgraduate courses offered in the University and the faculty is highly distinguished. The University consists of a total 5000 students and the faculty members to teach them are over 400. There are 46 different Departments and Centers which are spread in 12 schools for the study in the University. The Dean of the University is Prof. B. Kamiah, the courses offered in the University are 150 which are divided in all departments for study courses like Ph.D., Post Graduate, Diploma, Distance Education, short-term courses etc. The duration each course is different like the Master’s program which has the total duration of 5 years and the scholars from abroad which the University has been hosting and the number of candidates in it has been significantly increasing. The students who want to register themselves in the courses offered in the University will have to wait till the notification are uploaded for the admission on the official website which will be for all the courses in the University. The Admission in various courses offered in the University will be opened for all the candidates who wish apply if they are eligible for the criteria of the prescribed qualification criteria. The application of the candidates in the 5 yrs. Course of M.Sc., M.Tech. M.Phil. and Ph.D. courses stream for the current year through all India Entrance Examination. The application form is to be filled by the candidates in online mode only as the University has made it mandatory. The candidates have to fill the registration form for the admission in the different courses in the University which are affiliated by it based on the eligibility. The candidate can visit the official website of the university and fill up his/her application form there. The candidate will be provided with the registration number. The candidate has to keep this number with himself till the time of admit card. The application form is available on the official website for the various courses which come under the Hyderabad University. The candidates who are looking for the admission in any of the courses have to fill the application form before the laste date. The candidate who is looking for the post-graduation courses has to pass their graduation from the recognized university in the country. For MBA, M.Sc. subjects, Candidates have to give an entrance examination which is CAT and if they score well then only they will get the admission. Science background students can also give CAT exam if they wish to pursue higher education from management side after B. tech. Written test will be conducted which will be of 100 marks it will be same for all the postgraduate courses for the M. Tech computer science course the admission will totally depend on the JEE main exam 2019. Tech IC technology course admission will be based on the scores received by the candidates in their GATE 2019 exam in merit list order which are Electronics and Communication Engineering, Instrumental Engineering and Physics. In M. Tech Bioinformatics the admission for this course is based on the marks scored by the candidate in the GATE examination and interview as well. The candidate should have appeared in the following subject’s MA Physics, CY mathematics, Agricultural Engineering, Electronics & Communication Eng. Sc. Ocean-Atmospheric Sciences, MBA Healthcare, and Hospital Management, MBA Business 12 Analytics, M.Phil. Integrated and M.A in communication courses admission will be fully based on the examination. Each of the course offered reservation of seats which will be allotted to SC/ST candidates. Seats for the PWD, Kashmir migrants, and the OBC candidates will be kept reserved also. The candidate appearing for the examination has to be the citizen of India. The candidate must not have had any criminal record or case in his name in any part of the country. The Hyderabad University has the rule for selecting the candidate for the undergraduate and post-graduation program by conducting the entrance examination will be done to get the best of the candidate from the state or across India. The candidates who want to do their post-graduation have to give an entrance examination and if they pass it with the eligibility criteria then they will be granted admission in the university. Procedure– It Includes mainly the most important step which is submission of Pre-admission enrolment form as this step has been made mandatory and after this only next step will be done. Please note that this data is based on the previous year so related notifications will be updated as soon as it arrives. The following are the steps in fulfilling the application form. The first step is that the candidate is must require to fill up the admission enrolment form online and submit the same with the admission form of Hyderabad University 2019. Fill up your personal and academic details carefully. After submission, candidates need to take a print out of the same. With this and all other documents are needed to be submitted along with Hyderabad University 2019 admission form before the last day of submission. The admission fee will be different based on courses, the entrance exam is conducted for all India level and candidates are selected on the bases of their performance in the entrance examination for the course. The examination fee is different for the candidate as some of them have been placed in the reservation quota of different class and category are appearing in the examination. The admit card will be issued by the University of Hyderabad. It will be available for download on the website from 20th May 2019. All candidates are supposed to bring the admit card along with them to the examination hall or else they will not be allowed to appear in the examination as it is the identity of the applicant, so make sure to preserve the admit card copy after printing till the time of admission procedure is completed successfully. Firstly, candidates need to log into the official website of the University. Now look for the link of admit card and click on it. Now enter the registration number for the admit card to be issued. The admit card of the candidate will display in the window. Check the details and take the printout as much as possible. The candidates will need to check for the results of the entrance examination and check their performance in it, so they can see their respective results on the website. Results for the examination will be uploaded on the official website shortly after the exams have been completed. All the candidates must download a hard copy of their results which will be used for reference later in the admission procedure. The following are the steps to help the candidates download their respective Results from the website. Click on the link given for the results. Submit your roll number in the field given. The examination results will be declared on the official website platform of the University. All candidates are advised to regularly check for the results on the online platform. The University will only issue the results in online mode so all candidates must responsibly get their desired information from the official website of the university. Once the examination is completed successfully, the candidate will have to wait for the merit list and the candidate who has cleared the exams with good marks will get the opportunity to enter in the counseling session. At the time of counseling, the candidates class 10th, and 12th marks are also checked and also the score of CAT, MAT, GATE etc. The merit list and cut-off list for the various affiliated courses are issued and which come under top ranking of Hyderabad university in India. Only those candidates are liable for the round of counseling who has their name in the list. Seats will be allocated to the candidates depending upon the competition. For now, seats are limited and applicants are large in number. Every offered course in the university has a limited number of seats every year. As it has not officially announced how many seats will be allocated in respective courses to the students. If you want your seat and you must earn it by entering into cut out competition all across the country. However, seats are also given based on the reservation which can be easily understood by the given table-The candidates will be allotted seats which will be based on the marks they score in their GATE and Entrance exam 2019. All the candidates who will qualify for the gate and have applied to the attend the counseling procedure are also advised to follow the same criteria of UOH 2019. The candidate who want to study at the Hyderabad university they have to fill the entrance examination application form. The university will issue a cutoff list and the merit list for the various courses in the university after the examination and they will call for the counseling to the center or the college. The candidate merit list can come more than one time by the university to get the equal amount of admission in the university. The candidate is also selected as per their percentage scored by them in their intermediate. The candidates have to see that the submission of the application is done before the last date because the candidates who will submit their application after the last date will not be late be accepted by the university.